In this very extensive online library, we present a selection of reference articles from our Newsletter, and a number of additional articles specifically produced for this website. We hope this information will provide both enjoyable reading and will help you better understand your tortoise or turtle's needs. Feel free to link to these pages from your own site. New articles are added regularly, so check back from time to time for updates. These articles are grouped together by subject to make browsing easier. Do not forget to check our CARESHEET section as well, which now includes printable versions of basic information on many species, and a variety of posters, notices and other resources in downloadable PDF format. Please note that where veterinary treatmens and/or drug dosages are discussed these are for general educational purposes only. If you have a sick tortoise, consult a qualified veterinarian. We make this information available because in our opinion, the better informed keepers are, the better they are able to recognise serious illnesses and the better able they are to evaluate veterinary treatments which may be suggested. Information on individual species, housing, lighting, heating, safety, buying tortoises, ponds and filters for aquatic species, substrates and diet., etc., subdivided into several sections for ease of reference. Information on egg incubation, housing and rearing hatchlings, etc. Exploitation around the world - and some efforts to help. The classification of tortoise and turtle species, and field reports, etc. Comprehensive set of articles covering most common (and some uncommon) health issues that every keeper should be familiar with. Also includes Veterinary Contact Index. Essential information everyone should know. A series of in-depth articles on nutritional management and feeding in captivity. You wil find a lot of information here on how to avoid nutritional problems for a wide variety of species and the correct use of vitamin and mineral supplements, etc. Tortoise Trust Winter Diet: Easy feeding even over winter! Mediterranean Tortoises: How much to feed? Tortoises: Do They Need To Drink ? Notes on Dietary Constituents for Herbivorous Terrestrial Chelonians and their effect on Growth and Development. Fussy feeders - What to do if you have a tortoise who demonstrates 'addictive' dietary patterns. This section contains vital information and advice on lighting, heating, humidity control and various ideas for pens, vivariums and both indoor and outdoor housing methods for a wide range of species. Hemp bedding and substrates - Danger! A Habitat for Horsfields - Includes good info on vivarium design for other species too. Read before buying a 'fish-tank' vivarium for a tortoise! Practical notes on creating humid tropical vivaria for tortoises and turtles. This section contains all the information you need to provide aquatic turtles and terrapins with the correct environment and diet. From basic care to advanced husbandry concepts, you should find what you are looking for in these articles. The topic of hibernation often causes a lot of concern. In this section, we have gathered together some of the best articles on the subject from the past 20 years of the Tortoise Trust Newsletter! Warm Autumn = Hibernation Problems? Waking up from Hibernation - Essential Info! Some articles covering the care of individual species, and a range of other articles on safety, general care and maintenance that do not fall within any of our other main categories. Keeping & Breeding Tortoises in Captivity Exclusive! Full text of species profiles from Keeping & Breeding Tortoises in Captivity (1990). Includes: Testudo graeca, Testudo hermanni, Testudo ibera, Testudo marginata (Mediterranean tortoises), Geochelone carbonaria, Geochelone denticulata (Redfoot & Yellowfoot tortoises), Malocochersus tornieri (Pancake tortoises), Terrapene carolina (Box turtles) and others, with identification, incubation, environmental and feeding guidelines. 7 Simple Rules for Successfull Tortoisekeeping. Should I give my Tortoise a Bath? Practical care & breeding of the Horsfield's or Russian tortoise in captivity. Kinixys erosa (Schweigger 1812) - A Captive breeding experience. 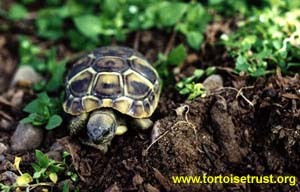 Captive breeding of the Egyptian tortoise Testudo kleinmanni. 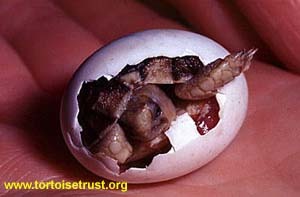 An effective method of artificial incubation for mediterranean tortoise eggs. Artificial incubation techniques in relation to Testudo graeca & T. hermanni with notes on embryonic anoxia as a possible factor in hatchling mortality in captive breeding programs. Status of the Egyptian Tortoise, Testudo kleinmanni, in Egypt. 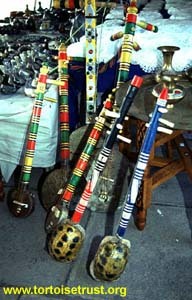 The trade in tortoise-derived souvenir products in Morocco. The Spiny-Tailed Lizard at home. Biotype, nomenclature and taxonomic diagnostic characters of Testudo hermanni hermanni GMELIN 1789 in Southern France with preliminary notes on comparative egg morphology with T. h. boettgeri MOJSISOVICS 1889. A revision of the Testudines of North Africa, Asia and Europe - Genus: Testudo. Preliminary report on the Taxonomic, Biotypic and Conservation status of the land tortoises of Tunisia. Tortoises of north Africa; taxonomy, nomenclature, phylogeny and evolution with notes on field studies in Tunisia. In search of little-known tortoises in southern Turkey. New light on an old tortoise - Gilbert White's Selborne tortoise re-discovered. New record size for north african Testudo. This section includes data on treatments and medications which should be used under qualified veterinary supervision only. If you have a sick tortoise or turtle please seek qualified professional advice using the link below. Albendazole & Ivermectin - A warning! Shell injuries - Practical guidelines for vets. Worming difficult to handle tortoises and turtles. Understanding common worms and protozoa. Disease prevention in tortoise collections.